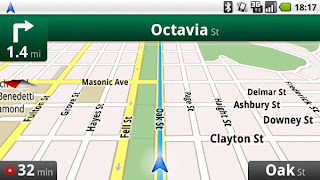 How will the navigation software react, if you drive the wrong way. Will it detour you? Possible Answer: The caching of map material will include a buffer around the route. This will cover most of the detours and allows rerouting within a certain area. Of course there are some limitations because the street network is tricky and the buffer has to be calculated according to network properties. What is about Live traffic information and congestion warnings? Possible Answer: The Navigation software will not be able to retrieve live traffic information over the air. Therefor is information cannot be used. In order to make routing better statistical or experienced traffic data can be preloaded to different times and applied to the route. As alternative an forecast about estimated travel times has to be calculated based on current and historical data. All in all this will be an very interesting possibility for Google Maps and competitors have to worry about. Some rumors speak about an possible release date before Summer 2011.